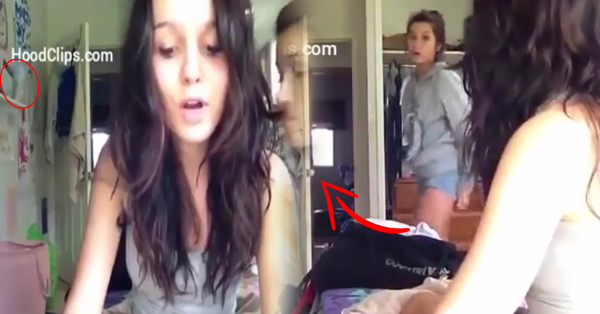 Ghost Insinuated on a Video of a Girl while Singing with a Friend inside Her Room! It is not new to us witnessing so many talented people that have been discovered through their own social media posts. We cannot deny the fact that social media gave a very huge portion of entertainment to people. But these two young girls intend to do their sensational video by singing the song of Katy Perry “The one that got away”, but it turned out to be a scary movie. It started when the door of their room suddenly opens by itself and the tumbler fell from the divider that seems like someone pushed it. One of the girls saw how it happened then tried to stand and check it out, but they got shocked when the door banged forcibly and closes by itself. They couldn’t believe that they will become famous because of this frightening video. They at least thanked the video recorder because they can still prove to their friends that there is something creepy happening inside their room.